Terms and Conditions – BettingIn.com Date: 01/07/2010 Please read this terms and conditions to learn more about the policies and procedures of BettingIn.com. In addition, BettingIn.com wants that all users feel comfortable, so we always take all necessary steps to protect your personal information. This terms and conditions describes the information we collect from you and what may happen to that information as part of the normal operation of our services. Bettingin.com strives to provide a consistent set of privacy practices across betting community. Please note that only english is allowed and by accepting the terms and conditions, cookies policy and the User Agreement at the point of registration, you accept and agree that you are familiar with english language. If you are under the age of 18, you may only use this site in conjunction with and under the supervision of your parents or guardians, and with express permission from Bettingin.com. For this reason, we ask that children do not submit any personal information to Bettingin.com. In general, you can browse a large portion of the site without telling us who you are or revealing any personal information about yourself. Once you give us your personal information, you are not anonymous to us. If you choose to use our services, we may require you to provide contact and identity information, possible billing information and other personal information as indicated on the forms throughout the site. Users have the option not to provide information by choosing not to use but only in a particular service or feature. We provide you the opportunity to opt-out of having your personally identifiable information used for certain purposes when we ask for this information. For example, if you register for a user account but do not wish to receive any additional marketing material from us you can directy contact us or unsubscribe directy via email. If you no longer wish to receive our newsletter and promotional communications you may opt-out of receiving them by following the instructions included in each newsletter or communication or by emailing us at info@bettingin.com. Under some possible circumstances we may require some additional financial information, including, without limitation, your billing address, bank account information, a credit card number and expiration date, and tracking information from checks or money orders. Some of our business partners (e.g., advertisers) may use "cookies" on our site. We have no access to or control over these "cookies." This privacy statement covers the use of "cookies" by Bettingin.com only and does not cover the use of "cookies" by any advertisers. We use your information and other information we obtain from your current and past activities on the site to resolve disputes, troubleshoot problems, collect fees owed, pay amounts due you, verify your account data, measure user interest in Bettingin.com 's products and services, inform you about online and offline offers, products, services, and updates, customize your experience, detect and protect us against error, fraud and other criminal activity, and enforce our User Agreement. At times, we may look across multiple users to identify problems or resolve disputes, and we may examine your information to identify users using multiple Login Names. We may compare and review your information for errors, omissions and for accuracy. You agree that we may use your information to contact you and deliver information to you that, in some cases, is targeted to your perceived interests, such as targeted banner advertisements, administrative notices, product offerings, and communications relevant to your use of the site. By accepting this Agreement, you expressly agree to receive this information. The following describes some of the ways that your personal information may be disclosed in the normal course of business as part of our services. Advertisers. We aggregate (gather up data across numerous registered user accounts) personal information and disclose such information in a non-personally identifiable manner to advertisers and other third parties for their marketing and promotional purposes. 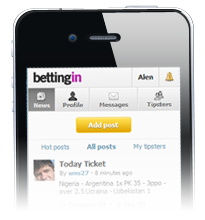 For such purposes, we do not disclose any information that could be used to identify Bettingin.com users personally. Affiliates for Our Operations. We may use third parties ("affiliates") to facilitate or outsource one or more aspects of the services that we provide to you (e.g., domain name search technology, advertising provisions, and other services) and therefore we may provide some of your information directly to these affiliates. These affiliates are subject to confidentiality agreements with us and other legal restrictions that prohibit their use of the information we provide them for any other purpose except to facilitate the specific outsourced service, unless you have explicitly agreed or given your prior permission to them for additional uses. In some instances, the affiliate may collect information directly from you. In these cases, you will be notified of the involvement of the affiliate, and all additional information you provide them and their additional uses will be up to you. Agents and Business Entities. We share much of our data, including personal information about you, with our affiliates, subsidiaries, and joint venturers that are committed to serving your online needs and providing related services throughout the world. We use an outside credit card processing company to bill you for goods and services. These companies do not retain, share, store, or use personally identifiable information for any other purposes. To the extent that these entities have access to your information, they will treat it at least as protectively as they treat information they obtain from their other users. Our affiliates, subsidiaries, and joint venturers follow privacy practices no less protective of all users than our practices described in this document, to the extent allowed by applicable law. Bettingin.com , its affiliates, subsidiaries, joint venturers, or any combination of such, will share some or all of your information with another business entity should we plan to merge with, or be acquired by, that business entity. Should such a combination occur, we will require that the new combined entity follow this terms and conditions with respect to your information. Legal Requests. Bettingin.com cooperates with law enforcement authorities, as well as with other third parties, to enforce laws, intellectual property rights, and to prevent fraud. In response to a verified request by law enforcement or other government officials relating to a criminal investigation or alleged illegal activity, we can, and you authorize us to, disclose your name, city, state, telephone number, email address, login name history, fraud complaints, and site use history, with or without a subpoena. Without limiting the above, we will not disclose your personal information to law enforcement or other government officials without a subpoena, court order or substantially similar legal procedure, except when we believe in good faith that the disclosure of information is necessary to protect our rights or to prevent imminent physical harm, financial loss or to report suspected past, present, or future illegal activity. Further, we can, and you authorize us to, disclose to a third party your information, including your name, street address, city, state, zip code, country, phone number, email, and company name, as we in our sole discretion believe necessary or appropriate in connection with an investigation of fraud, intellectual property infringement, piracy, or other unlawful activity. You are responsible for all actions taken with your login name and password. Your Bettingin.com user password should be held in strict confidence and under no circumstances will Bettingin.com personnel, its agents or affiliates ask you for your Bettingin.com user password. If you lose control of your password, you may lose substantial control over your information and may be subject to legally binding actions taken on your behalf. Therefore, if your password has been compromised for any reason, you should immediately change your password as detailed in the paragraph below. If you use the discussion located on our site (wall commentary) you should be aware that any personally identifiable information you submit can be read, collected, or used by other users of these page and could be used to send you unsolicited messages. Bettingin.com is not responsible for the personally identifiable information you choose to submit. Except as otherwise expressly included in this terms and conditions, this document only addresses the use and disclosure of information we collect from you. To the extent that you disclose your information to other parties, whether they are bidders, buyers or sellers on our site or other sites throughout the Internet, different rules may apply to their use or disclosure of the information you disclose to them. Bettingin.com does not control the privacy policies of third parties. Bettingin.com follows generally accepted industry standards to protect the personal information submitted to us, both during transmission and once we receive it. We will try to protect your personal information but we cannot guarantee absolute security. Your information is stored on Bettingin.com hosted servers located in Europe. When you enter sensitive information on our registration or order forms, we encrypt that information using secure socket layer technology (SSL). We treat data as an asset that must be protected against loss and unauthorized access. We employ many different security techniques to protect such data from unauthorized access by users inside and outside the company, but "perfect security "does not exist on the Internet or with any data, digital or physical. Bettingin.com is not responsible for any decisions made, financial or others, based on information or links provided by bettingin.com or other users on the page. Bettingin.com cannot guarantee the correctness of betting and other information which contained links, partners and users information. Bettingin.com do not undertake any responsibility and/or liability for any losses and/or damages sustained by any person or persons using services on our site and we shall not be responsible and/or liable for any losses or damages due to any information or otherwise contained on this web site or through links, sponsors and email correspondence, whether due to inaccuracy, error, omission or bad judgment or any reason whatsoever. We also do not accept any responsibility or liability for the comments of our viewers as may be posted. If you are offended or are in any way adversely affected by such contents, please contact us. But please know, that you enter at your own risk! Bettingin.com is not responsible in any way regarding picks and predictions posted on this site. If you encounter gambling problems of any kind, please contact the gambling help authorities in your area. As well, please check with your bookmaker for the latest and fresh odds. We will not be liable for any incorrect odds and lines posted at our site. Please note that Bettingin.com is not responsible in any way regarding placing bets through links or banners that placed on its site. All visits to our customer's sites are purely responsibility of your own. When our tipsters chose a bookmaker for their predictions, they are using the bookmaker of their choice, and Bettingin.com have no influence in this. Bettingin.com does not provide gaming or gambling capabilities on its site. It is a sports community site, while odds and betting lines are part of that information. It is very important to check the laws and regulation in your own country regarding gambling betting, as it might differ from country to country. Everything said or done on our page of cummunications is solely the responsability of the individual who originally posted it. We reserve the right to make changes to terms and conditions at any time by posting the amended terms on the site, so please check it frequently.